The Five Dragon Pavilions, linked to one another by stone bridges at the waterfront, are a major scene on the northern shore of the Beihai Lake. 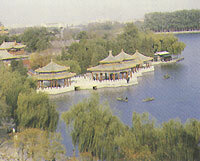 The Pavilion of the Dragon's Benevolence stretches into the water. Looking east from the northern shore one sees picturesque rooftops and stone balustrades that from the zigzagging waterfront, with the Jingshan Park and its hilltop pavilions shimmering in the background.